The opioid crisis is the latest issue to be addressed shallowly by the Roseanne revival, but it’s not the meat of “Netflix & Pill.” Once again, Becky and Darlene provide the real conflict while Roseanne and Dan enjoy ham and cheap sparkling wine. Well, the food and beverage happen to be treats for the Conners’ 45th wedding anniversary, which is a rather restrained affair because they’re stuck paying for it, despite having three adult children. Some things, like playing hot potato with the check, never change, which is especially frustrating when so many other things—like the cost of healthcare and the job security afforded by a college degree—do. But it’s a relatable moment, as is finding out that there’s no such thing as a free night in a hotel. Roseanne and Dan have already paid for their accommodations and then some—they’re on the hook for their credit card debt, but in order to enjoy the reward for spending money they don’t have, they had to have paid off some of said debt. At least, enough to cover the $50-$100 in credit card funds that hotels put on hold when they run your card (but who knows, maybe the Radford Suites requires greater reserves). It’s frustrating and embarrassing, and the Conners let the attendant (Tim Bagley) know it. They manage to leave with some of their dignity intact, as well as several apples. 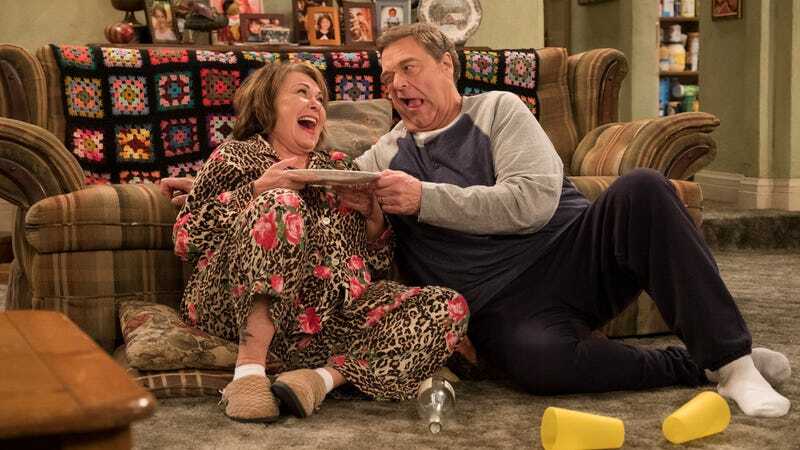 But when they move forward with the celebration at home, Dan finds out about Roseanne’s stash, and suddenly her withdrawal symptoms are the least of her problems. I could go into how the opioid epidemic isn’t as white or rural as some outlets (and presidents) would have you think, but Roseanne’s treatment of it is benign and almost considered in comparison with the way it’s handled housing insecurity, elder care, and job scarcity in working-class towns. It’s not terribly thorough, though. We don’t know how Dan will pay the $3,000 deductible for Roseanne’s surgery, and neither does he, but I hope the show won’t just wave this financial crisis off. It probably will, though, because the revival hasn’t really stuck with any issues. Real concerns like what happens when social security isn’t enough or marginalized kids are bullied become defining characteristics only when it’s convenient for the writers. Otherwise, elderly parents and gender-nonconforming kids have to find ways to occupy themselves offscreen. But in Becky and Darlene, the revival has established some consistency. We’ve seen them deal with financial concerns, and in ways that are true to their characters, no less. Earlier in the season, Becky was banking on the physical to secure her nest egg, and wound up mixing her personal desires—the children she always wanted to have with Mark—with the business of being a surrogate for Andrea. Darlene gave her grief, of course, but that’s because she feels Becky has other options. The younger sister has to believe that, because she’s still hanging on to the hope of becoming a professional writer. The likelihood of finding that kind of work in Lanford is pretty low, since Darlene’s had trouble landing any kind of job. But she’s too judgmental (even of herself) to accept anything less than her chosen profession (I wonder, though, if she can call it that, given that she hasn’t actually written professionally—not as an adult, anyway). The sisters are in the same un(der)paid boat, which is how they end up briefly arguing over who gets to replace Crystal (hi, Natalie West!) at the casino. Their responses are reflexive—Becky sees this as a step up, while Darlene takes one look at the “saloon gal” getup and deems it beneath her—and back up what we already know about them. At first, Becky ignores Darlene’s dismissive “It’s not really my thing” attitude. But when Darlene changes her mind (with a little prodding from her dad) and *SIGH* agrees to accept the steady income and great benefits, Becky calls her out for her casually classist behavior. The sitcom format guarantees that Darlene learns her lesson, but before that, feelings of resignation and resentment well up in both of the sisters. Becky’s afraid of moving on in her professional and personal lives, so she’s especially sensitive about any jabs about the quality of her work (and dates). Darlene’s much more proficient at dishing out criticism than she is taking it, but she does hear what Dan says about needing to provide for her kids. It’s more than a little sad to see the ambitious Darlene settle, though not because she’s joined the service industry (all work is respectable, as long as you’re not exploiting others). I see a lot of myself in Darlene, and her struggle to establish her writing career hits close to home. But I imagine that seeing these characters, who we watched grow up on screen, come to terms with economic realities is a gut punch for any fan of the show. The series has touched on the jobs issue (and the huckster who claimed he’d “bring them back”) and class transition/divide before, but nowhere near as successfully as it does here. It’s a moving reminder of where the revival’s potential truly lies. “Netflix & Pill” was written by Betsy Borns and directed by Andrew D. Weyman. One of the most unexpected things about this show is just how old it makes me feel. Roseanne and Dan have been married for 45 years, Jackie is in her 60s, DJ has a daughter—I know it’s fiction, but damn, time does fly. Uh, good news, I guess? The president of ABC Entertainment says the second season of the revival (or season 11, whichever you prefer) will prioritize family over politics in its storytelling. I was genuinely moved by Becky giving up an opportunity for her sister. She might not need the job as much as Darlene, but it’s still a big sacrifice. Who can turn down work these days?